Here are three wonderful sources for free, Christian MP3 downloads that you can play on your computer or iPod. SermonIndex.net has a huge collection of high quality sermons. No registration necessary. Check out the ones by J. Edwin Orr if you don't know where else to start! Another huge collection of sermons. Some interesting, and and a well-designed site. A good source for free audio and video downloads. If you register, they offer one free download per day, about topics which are usually very interesting and not found on other sites. Unfortunately, they do require a US credit card to register, and you can't share the MP3s with other people. Tell us things that most people don't know but need to know. Tell us things that are important and substantive, not trivial. Remember Jesus' words: "[E]very careless word that men shall speak, they shall render account for it in the day of judgment". Stories about God working in your own life are especially welcome. Each of us has a unique piece of "His-story" to tell. Also wanted: stories about unique (good or bad) aspects of your culture that will motivate us to pray for your culture to come to Jesus. Items you write yourself, not "forwards"
No pictures, videos, etc (the email-submission part of Blogger can't handle them). Don't be offended if I don't publish your post or if I delay in publishing it. I'm really picky! Thanks for helping make my blog a source for meaningful, thought-provoking, unique communications! Rather than despair over Hollywood's ruinous influence over our culture, Doug Philips set out several years ago to help birth a Christian film-making movement. So far, it looks like God is really blessing his labor. Click here to read a lengthy but hope-filled account of how Christians are learning to use the media of film. If you want to learn better English or want to get into God's Book more regularly, we have settled into a regular schedule for reading God's book as a group on Skype. We read at two times every day (except Sunday), 1 PM and 5 PM US Pacific time (2100 and 0100 GMT). Each reading covers about 3-4 chapters, includes prayer and discussion times, and lasts about 90 minutes. For me, it's really been great to get soaked more in God's Word! When we discuss the chapters as a group, I see things that I don't pick up on my own. If you are interested in joining us, please Skype me or email me! Our Gas Thief: A Motivation to Give People the Gospel! This week, someone stole approximately 7 gallons of gasoline from one of our cars and broke the gasoline port door latch on the other car. I would probably not have noticed it except we just filled up the car on Monday morning and the trip odometer only had 11 miles on it on Wednesday, but it showed only half a tank! The theft occured while the car was parked in our carport (see below). We live in a small town and this is the first time we've personally experienced crime here. To me, the message of the crime is that I need to tell people about Jesus. Jesus is the only one who can change a thief into a worshipper, like He did during His last minutes on the cross. When we avoid the mission field, God has a way of sending the mission field to us through crime. It reminds me of something that both Richard Wurmbrand and Brother Andrew have said:If we don't go to the terrorists with the gospel, the terrorists will come to us with bombs. This is not to say that it's our fault that we got robbed, or that when someone is the victim of crime, they are responsible. I'm just saying that Jesus is the solution, and we must tell people the good news about Him! When good men do nothing, evil triumphs. Here in the US at least, there is some uncertainty about what Muslims mean when they say "jihad". 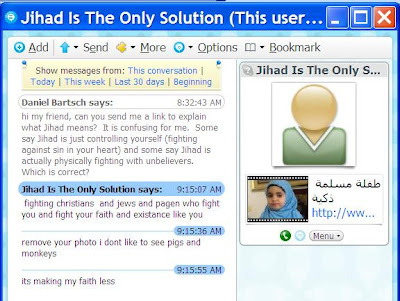 So when one of my Muslim contacts changed his Skype ID to "Jihad is the only solution" I thought I would ask him what he meant. He then blocked me from being able to contact him in Skype again. Pray that he will see and know the love of Jesus. A lot of Muslims around the world are really stressed right now about what is going on in Gaza. A stirring reminder that the tools we use for sharing Jesus can also be used to promulgate error. Let us not sleep during the harvest season. A friend asked for our recommendations as to a schedule for reading through the Bible in one year. Here is one that arranges the Bible somewhat chronologically and yet gives some from the Old Testament and some from the New Testament each day. Book Recommendation: "In Crossfire of Hate"
Why "In Crossfire of Hate" by Martha Wall didn't become a better known classic after its publication in 1970, I don't know. It is the true, gripping account of God at work in rural Colombia during the height of the terror of "La Violencia" from the viewpoint of the Marco Franco family. Mr. Franco, a philandering drunk like many of his neighbors, heard--and vigorously rejected--the good news about Jesus. At that time and place, evangelicals were a despised and persecuted minority. The second time Marco heard the gospel, he embraced Jesus. The change in his life was dramatic and instantaneous. He never drank alcohol again. He decisively ended his relationship with his consort (while continuing to financially support her and her children). His raging temper that kept everyone on edge with fear was brought under God's control. He immediately began sharing the good news of forgiveness of sins through Jesus with everyone around him. His immediately family members were so amazed by his transformation that within a short time they were all Christians too. The Franco family, and Marco particularly, suffered brutally for their new faith. They repeatedly fled for their lives, were robbed, threatened, and beaten. Several times they escaped only because of the direction intervention of God. If they had kept their faith 'private' none of this would have happened. But to become an "evangelico" was to become an evangelist. The had never met a quiet Christian. They repeatedly chose to open their mouths and home even though they knew it could cost their lives. And, amazingly, in the midst of their terrible suffering, the church grew. Their neighbors could not help but take seriously something that Marco was willing to die for. The gospel fire that started with Marco spread from family to family and from village to village until the whole region was ablaze. The challenge to us: God did that with an illiterate, impoverished drunk. What has He done with us? Some books tell a good story badly, and some books tell a poor story well. This book tells a great story well. (If it weren't so violent it would make a great movie.) The book is out of print but you can still pick up copies for under $5 (including shipping) using Bookfinder.com. May it challenge us to follow Jesus all the way.